It has been emotionally tough, very tough. In another article, I reported about Mayor Adamowicz’s death. In the next days everyone is still in shock and a storm of emotions are unleashed. At my home it was not different: tears were shed and we wanted to get some form of consolation. Spontaneous movements of solidarity were formed and people paid tribute to their Mayor. Emptiness… That’s exactly what you feel when someone close is gone. I have been there twice myself in 2009. I cannot say I am related to this Mayor in any way and yet, I feel there is an awakening, something I haven’t felt for a long time. Citizens of Gdańsk grief. My lifepartner went with her brother on Thursday as there was an improvised event where people gathered to commemorate their leader. A giant heart of candles was put together breaking a record of the most candles placed. A very powerful moment is when a on stage a singer sang the song: Sound of Silence (covered by ‘Disturbed’). As I was recovering from a bad cough, I did not go to pay tribute. I still feel sorry that I couldn’t go. There were around 50.000 people queuing up for this on Friday. Impressions you can find in the video below. 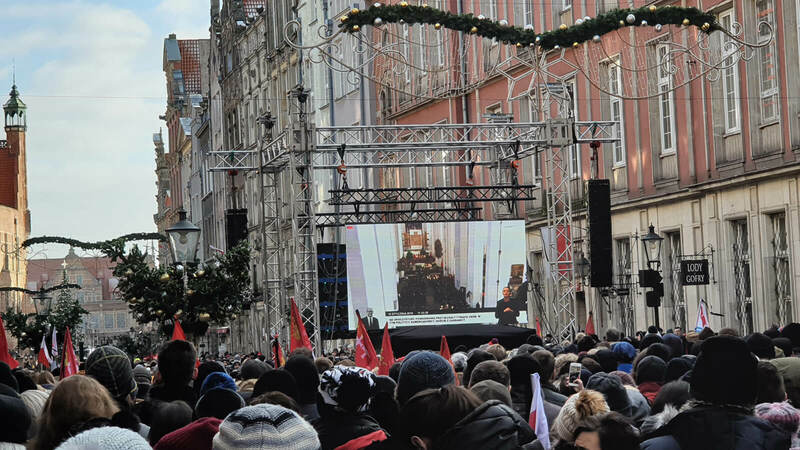 There is a mix of 2 sorts of scenes you can see in the video: scenes of the giant heart of candles and scenes of the tribute that the citizens of Gdańsk pay at the coffin to their deceased Mayor. You see how people warmly dressed wait patiently for their moment to pay tribute. On Saturday I felt way better. I dressed warmly to cope with the cold to be present at the funeral of Paweł Adamowicz as it was already clear that we would be standing outside. As much as 50.000 people were expected that day. It was a winterday and yet it did not really freeze. It did not snow. Even if it would have, I am sure people would have taken it that much to witness their Mayor’s funeral on huge screens. The entire Long lane, leading to the Maria Cathedral was entirely packed. We were standing amidst the crowd together with our friend Łukasz and his wife. The church was fully packed and in the nearby streets they erected big screens on which people were able to follow the entire funeral. An idea of the amount of people that were following this screen you see in the small video below. The entire mass with the preparation was broadcasted by Polish media and on YouTube you can find the about 3 hours 40 minutes in Polish only.